For expatriates relocating to Dubai and living in freehold (owned) and non-freehold (rented) housing you will need to set-up an electric and water utility connection with DEWA (Dubai Electricity and Water Authority). An important factor to understand in the DEWA billing process is the associated housing fee that is incurred. Housing fees for expat tenants is calculated on 5% of the unit’s annual rent, while expat owners must pay 0.5% of the value of the property as determined by RERA’s (Real Estate Regulatory Agency) rental index. These amounts are divided by 12 months and each month invoiced in instalments. DEWA is requiring expats both living in freehold and non-freehold properties to register their accommodation details on the municipality’s portal in order to assist them to calculate the associated housing fee and to enable the invoicing of DEWA’s monthly utility bills. Read here How to set up Dewa. It is important for expats to clearly understand this process as you could risk paying a higher housing fee according to the RERA index, which may not be equal to the actual rent being paid. In addition, if you have negotiated a lower annual rental amount on a lease renewal it would be beneficial to take your documentation including most recent DEWA bill, copy of tenant’s passport and the new tenancy contract to the DEWA office to negotiate housing fee adjustments. A listing of DEWA locations, phone numbers and office hours can be found on the DEWA website. Check the Housing Fee on your DEWA bill today to check that this is the equivalent of 5% of your current rent. I moved in to Dubai last year, and rented a fully furnished Studio in Armada tower JLT on the 24th of November 2013. 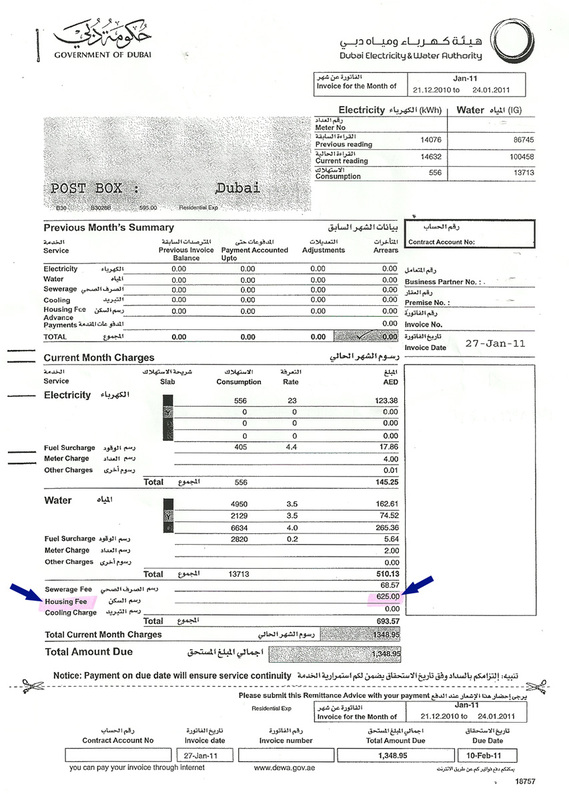 Before signing the rent contract, the management explained that DEWA bills will be taken care by the management as I’m paying for a premium (AED 72,000/ year) which included water, electricity, cable, internet, chiller, and once per week housekeeping. So basically, it’s very similar to a hotel apartment. However, on the 1st of June 2014 (6 months later), I received an email from the management explaining that im supposed to pay 300 AED/month for all the past months as well as the months yet to come. They said that as per my contract, ” THE SECOND PARTY UNDERTAKES TO PAY ALL FEES AND TAXES LEVIED ON THE USAGE OF THE UNIT BY MUNICIPALITY OR GOVERNMENTAL BODIES NOT LIMITED TO THE AGREEMENT ATTESTATION FEES AT RERA”. I checked my contract and it’s actually true that this statement is mentioned. But im surprised how come they never informed me about it when I first moved in. The management was very misleading. I am also surprised how come they waited 6 months before sending me a notice. Noone from the management ever informed me in the past six months about due payments. So what should I do right now? Should I simply pay? Or should I take another action? I think you will need to pay this as it is in the contract and is the municipality charge however, a letter of complaint to the management would not go amiss! I am planning to move to Dubai and I am looking for information about typical monthly consumption (houses, apartments) of water and electricity in Dubai among expatriates. Is 1500kwh and 18 000 IG realistic for two bedroom (3 room) apartment? Can you please share how much kwh and cubic meters expats typically use? Maybe you can share your experience?